For our February meeting, we had the pleasure of hosting the very talented Mike Sorge. Mike is a sculptural woodturner from Middlebrook, Virginia. 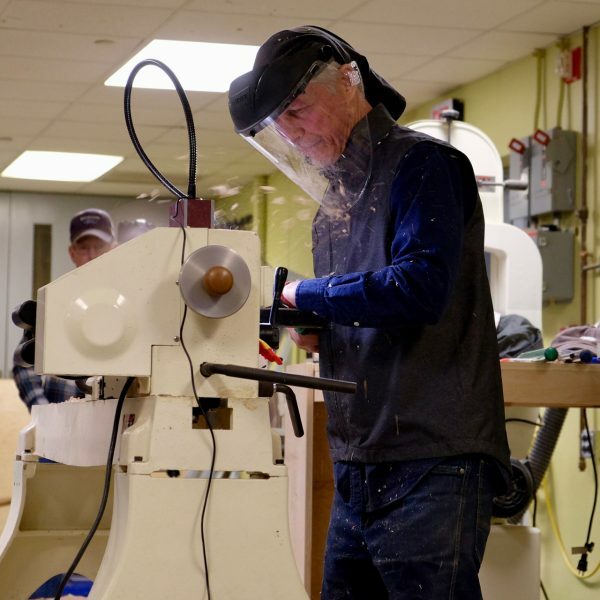 He is the Vice President and Program Director for Central Virginia Woodturners. Mike’s work encompasses a variety of forms, from utilitarian bowls, boxes, and platters to natural-edge bowls to sculptural cairn boxes, Spirit Birds, and other geometric forms. Mike presented his “Big Air Turning” demonstration for us. This type of turning involves large “winged” shapes, such as diamonds, triangles, and squares. Mike started with a diamond-shaped blank of maple that was just under 16″ from tip to tip, and about 2″ thick. He proceeded to explain and demonstrate how the blank is mounted in a chuck and turned. The result is a gracefully undulating winged bowl. Mike also described and demonstrated how he turns heart-shaped bowls. The blanks are cut into a heart shape on the bandsaw and then turned in the same fashion as his winged bowls. The demonstration was held at the STEM Lab in Mt. Pleasant High School in Wilmington, Delaware. Many thanks to faculty members Heather and John who volunteered their time and helped us set up. We look forward to future collaborations with the students and faculty of MPHS. You can view and download Mike’s detailed Big Air Turning instructions here. 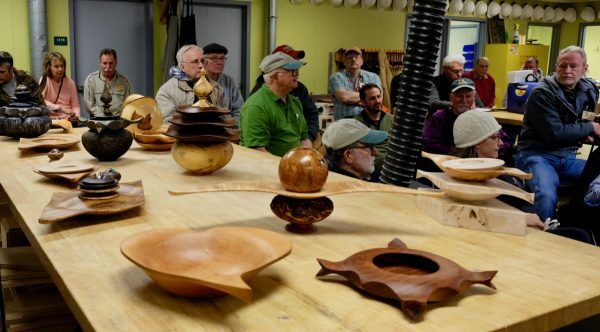 Additional photos from the evening can be viewed at First State Woodturner’s Photo Archive. You can read more about Mike and see many more photos of his work on his website.